Not much to show today. My design wall is in Va but I am in Maryland visiting my daughter and the grands. They moved into a new house last Sunday. 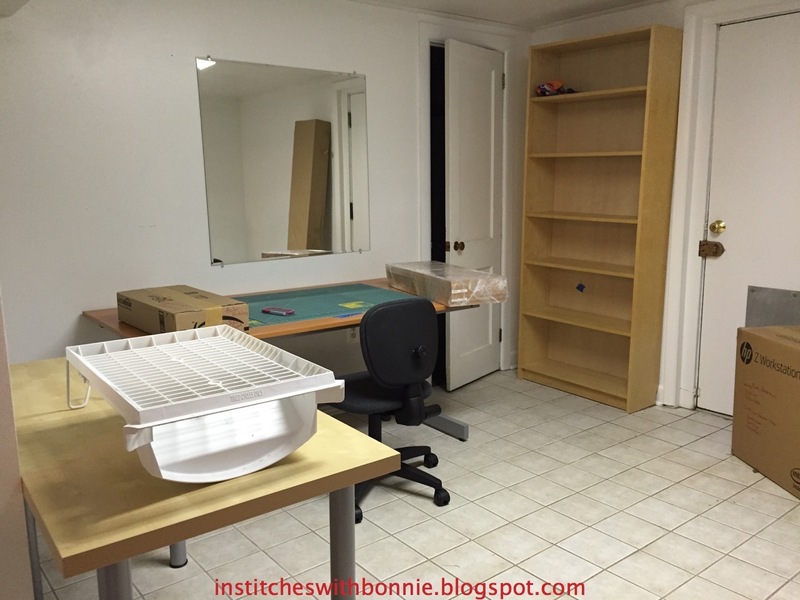 So, this morning Jenny and I spent just a little time deciding how she would set up her sewing studio. Closest table will hold her machine. The other table is her cutting table. (She's several inches shorter than me and that table height is perfect for her, not so much for me!) We've moved the cutting table to the right of the bookcase. A few books/magazines were unloaded on to the shelves but that is about it for now. The design wall will go where the mirror is and the ironing board will go where these boxes are. She still needs to get some wall shelves hung before she can do much else. Next time I come up it will be all set up and hopefully she'll be doing some sewing. I've been sewing hanging sleeves on a few quilts in preparation for the upcoming Faithful Circle Quilters biannual show. It will be in April this year. I have decided on 4 quilts to be entered. I can enter 5 so I need to make that decision in the next few weeks. Put borders on 2 antique 9 patches 2 sides of one small quilt were done – double ugh. That's it for me today. I'm linking up with Monday Makings and Main Crush Monday. Check out what is showing up on design walls across the Internet. I know Jenny appreciates your help, planning and unpacking. The room has good lighting and looks roomy, too. It will be wonderful!Love Lulu the flowering elephant, too! Moving is no small task. At least she has the basic lay out worked out. It would be fun to have a fresh start in a new sewing room. I hope she gets settled in and gets to play in her new room soon! 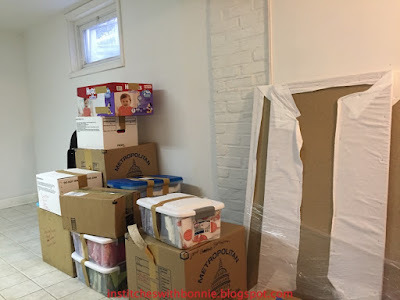 How much fun is it to help someone set up a sewing room! Awesome...and so clean!